Why a theory of change? Presently, services are in general neither reliable nor sustained, and nor are costs a major factor in decision-making around service delivery. To alter this situation, and bring costs into the equation, something has to change: the behaviour of the different sector stakeholders. … Why should having cost information that relates to different types of service, at different stages of the service delivery cycle, lead to better service? The only answer that supports WASHCost’s theory of change is that the sector actors involved in service delivery are motivated by the desire to use resources rationally, to provide the best service level possible for a given context and a given user group. However, the WASHCost team know that it is not as simple as that (encapsulated elsewhere in Patrick Moriarty’s comments on the use of RCTs as evidence: “It’s the (political) economy, stupid”). They go on to explain that there must be some form of decision-making arena with enough transparency where the different actors (service users or their representatives, service providers, and service financiers) can discuss the cost information and its implications i.e. a context of “good enough governance” (following Merilee Grindle’s phrase). 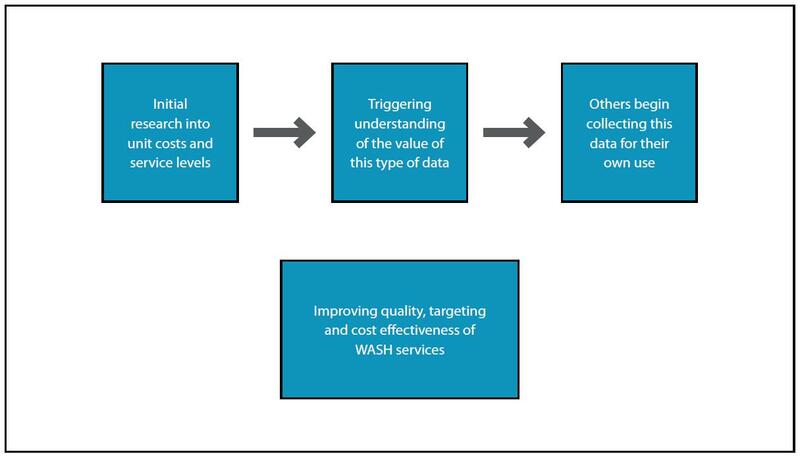 In this environment, WASHCost hopes that the initial project research into costs will trigger certain actors to start collecting and using costs data themselves – see the diagram below. This seems to be where the Triple-S ideas of relationship-led and value-led change fit in: WASHCost and its collaborators as a catalyst for a virtuous circle of improved cost data and decision-making. How long might any changes take to emerge? Patrick Moriarty suggests in the video below that if everything goes very well, the Triple-S and WASHCost approach of Learning Alliances can lead to changes in the way people see their role and how they act within three years if working directly with district level actors, and perhaps five years at national sector levels. These should be taken as the minimum periods needed, if everything goes very well – change is both hard and slow. However, there are already some positive signs of the effect that small catalysts can have in certain areas. 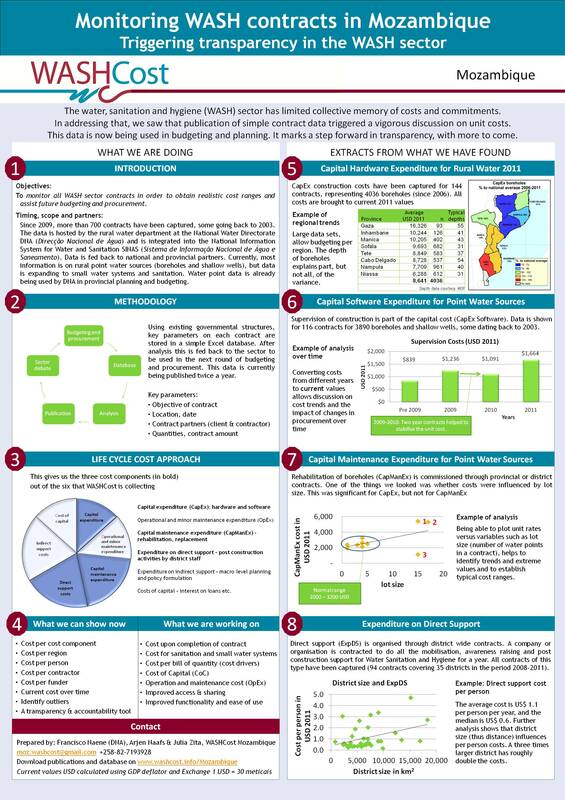 Arjen Naafs from the WASHCost Mozambique team presented a poster at the RWSN Forum on how the collection and publication of existing cost data in contracts for borehole drilling and rehabilitation quickly provoked a debate on the differing unit costs and the use of the data in subsequent budgeting and procurement: a combination of getting evidence in the open and letting peer pressure (between different regional offices) take effect. So we are gaining some insights into how change towards more sustainable service delivery can happen through action research coalitions. How might change happen in and from other organisations in the sector which are not directly part of these types of alliances? WaterAid is currently addressing this question through efforts to mainstream its Sustainability Framework within both the programming and the policy and advocacy work done by its country programmes. Richard Carter, head of the Technical Support Unit at WaterAid, has phrased this shift as “internal change for external influence”. In another session at the RWSN Forum, Nick Bundle, Regional Technical Advisor for WaterAid and focal point for sustainability, presented the Sustainability Framework and a conceptualisation of how this shift can develop in the organisation. 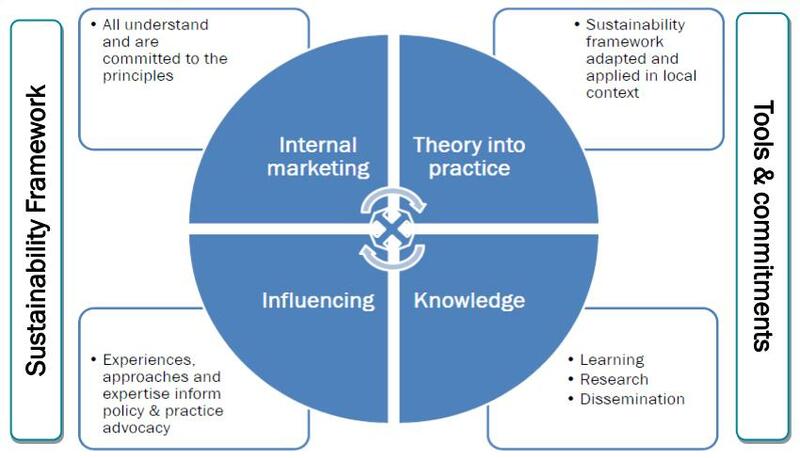 The diagram below shows this as a cycle of internal marketing within WaterAid; putting the theory of the Framework into practice in the country programmes; generating knowledge where there are gaps; and using these experiences to influence others. I will be helping Richard present an update on this process at an event organised by Triple-S and others on learning for sustainability next week (Tuesday 31st January in London, some spaces may still be available if you follow the link), including progress made by WaterAid and its partners in Mali in using the Sustainability Framework to analyse and address the challenges to rural service delivery. The change process within WaterAid in Mali so far has highlighted two key questions. The first is closely related to the Triple-S Theories of Change: who is best-placed to promote change? One of WaterAid’s partner staff in Mali, Moussa Sidibé, is an excellent champion for his work in developing more sustainable approaches in the municipality of Dandougou Fakala (more details on this are in the paper that he presented at the RWSN Forum, available here, in French) and demonstrating to his peers what is possible. However, I think there is a danger of relying too much on particular inspirational individuals; we need to find a balance with collectively mobilising change as well. The second key question is how the internal planning and reporting structures need to change to ensure that sustainability is properly considered in any decision made. As I discussed in my last post, current programming and monitoring is based on increasing the numbers of people served rather than understanding and improving the level of service people are actually accessing over time. WaterAid will soon be introducing a system of post-implementation surveys to monitor services at intervals of 1, 3, 5 and 10 years after the initial intervention, which will be an important internal shift in addressing sustainability. One of the challenges for the team in Mali is to combine this requirement with what is also needed by local actors for their own monitoring and follow-up actions, and for both these elements to support the government’s national database for waterpoint monitoring. Despite these challenges, WaterAid in Mali is making progress on addressing sustainability within their work on rural water services. In particular, programme staff and partners have agreed a set of key issues based on the analysis so far which must be allocated particular attention and resources for activities in the next financial year – planning and budgeting for this is going on at the moment. As these internal organisational changes make progress, WaterAid will be better placed to engage externally on changes towards sustainability in the Mali rural water sector as a whole.